-SG- (Sorry, chaps, here's another) ... when it's a Cotton! In the recent posting about Bob Collett's Scott Norton, I mentioned the recent Race Meeting at Cadwell Park - held to celebrate fifty years since the first VMCC race meeting there, and, of perhaps equal importance, seventy years since the VMCC was founded. As one of the 1966 participants I was invited to the event (still have the bike but regret not up and running) and it was good to see some of the old hands - and their bikes - again. And one of these was Jack Squirrell, another original rider, now resident in Switzerland, who came over to UK especially for the event. He brought with him the Cotton Norton he used in Vintage events with considerable success up to 1968. 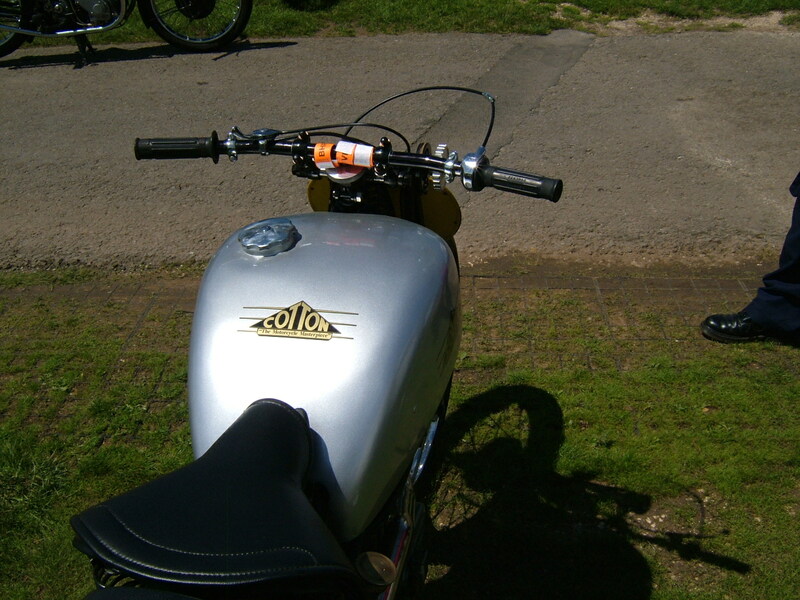 The photos attached give a reasonable impression of the bike as it is now - the forks are Druid incidentally and the front hub Velocette. The bike was originally put together in about 1934 by Wally Howes, a keen clubman who wanted something which handled better than his 1927 Model 18 ... but it's easier to read Jack's notes than for me to re-hash them, so they are attached too (below). But there's a real co-incidence regarding the engine now fitted to the Cotton ... back in the early sixties, I bought a Vintage Norton job lot from the late Joe Diver which included his flat tank racer and sundry spares. In amongst them was a saddle tank Norton frame number 41997, which was damaged - a crack where the top tubes meet the saddle lug. 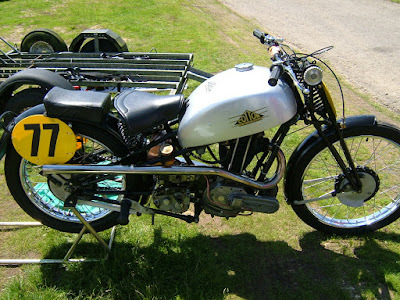 Eventually (in the mid nineties), I had this repaired by Eric Cheyney, the chap who built special scramblers etc. but meanwhile I asked the Science Museum what they could tell me about the bike with this frame number. The Museum held the Norton despatch records at the time and they replied to the effect that they could not find it in the records. A few years back, I passed on this frame and a few other surplus to needs parts to a friend up in Shropshire and shortly after doing so, I came across the frame number in the despatch records of which by then I had copies. No wonder the Science Museum could not find it - it was entirely out of any sort of sequence and related to a 1929 Model 18 which was not despatched until mid 1930. And the co-incidence? The engine originally fitted to 41997 is the engine now installed in the Cotton, although Jack did warn me that the unit in the bike when he got it from Wally Howes was replaced with the present ex 41997 engine when he re-furbished the bike some years ago. It seems that the Wally Howes engine (33846) was in for some bottom end remedial work with the Vintage Norton specialist Stan Johnson and when Stan died, this engine - and a few other items belonging to others - was inadvertantly sold by the family who disposed of all of Stan's bikes and parts as one extremely large lot. So where it is now is anyone's guess but if anyone can throw any light on its whereabouts, please let us know! -Jack Squirrell's notes- The 1927 Model 18 Norton that had I bought in 1958 was serving me well as an all round bike to participate in Vintage Motorcycle events of all kinds; I would ride in everything that was possible, make an entry and try and do my best, be it trials, grass track, hill climbs and especially my favourite, road racing! Although road racing was a lot of fun, the Model 18 left something to desired in the handling department. In other words, it could be a real handful and speed wobbles and back wheel slides came on much too often and without a lot of warning! What to do about it? The answer was to change bikes of course! I had no complaints about the Norton 490cc engine, it was a real gem and being a long stroke had plenty of low down grunt. The solution presented itself one day in early 1960, when talking to the manager of the experimental engine design office at The de Havillands Engine Company in Edgware, where I had just finished an engineering apprenticeship. The manager was Wally Howes and he had been a motorbike racer himself in the ten or twelve years leading up to the Second World War. 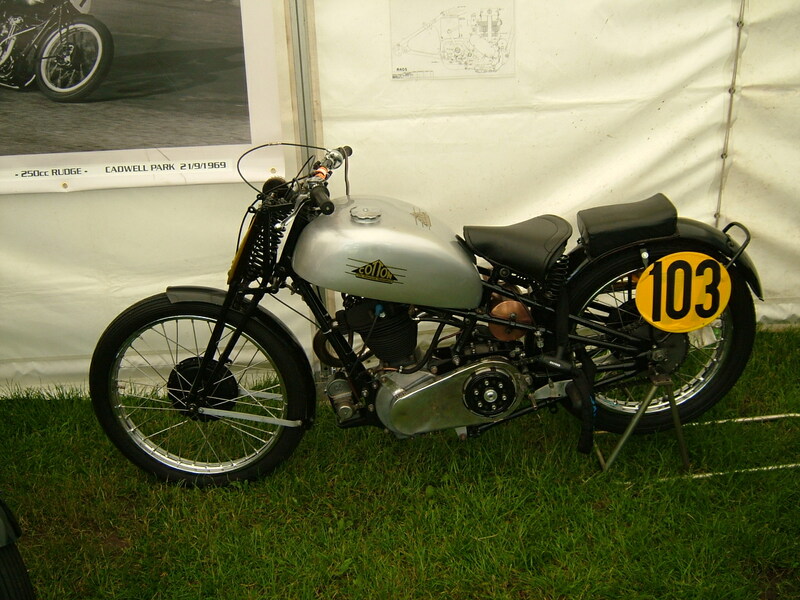 Wally had owned and raced a Model 18 Norton in the early thirties and had been a regular rider at Brands Hatch, when it was one of the top grass tracks in Southern England. Brands was one of the tracks where the Surtees family made their name in racing and John Surtees would watch his father ride in the sidecar events. It was in 1933 when Wally decided to give himself more chances of good results and bought a Cotton motorcycle frame and forks from Claude Rye, a West London motorcycle dealer based in the Fulham Road, Hammersmith. The Cotton had earned the reputation of having excellent handling and steering, just what all bikers crave for! It didn't take Wally long to fit his Model 18 490cc Norton engine into the Cotton frame including a slightly modified Sturmey Archer three speed gearbox also coming from the dismantled Norton. 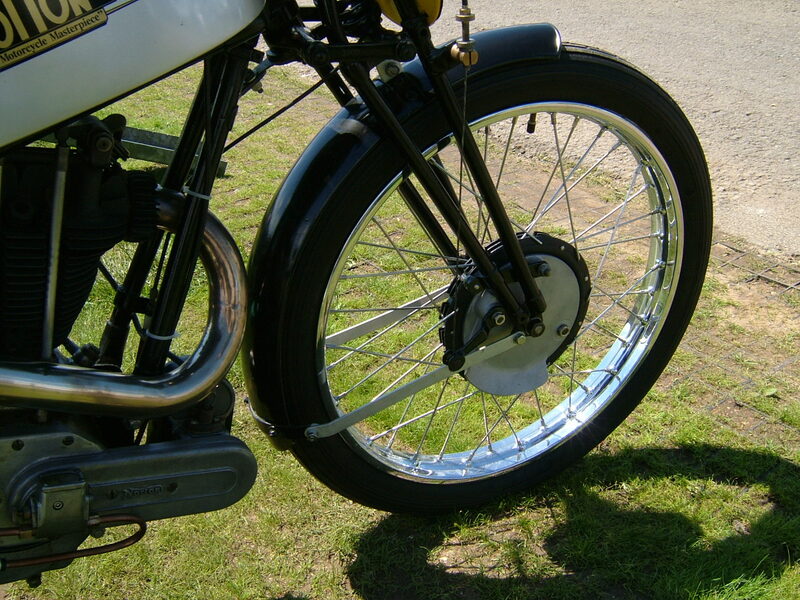 He fitted a front wheel from a KTT 350cc Velocette and the Royal Enfield rear wheel that was the standard Norton fitment. The year was 1934 and the Cotton-Norton was ready to roll. What Wally had achieved was a foretaste of the so called "Cafe Racer" by fitting a good engine into a superb handling frame. The subsequent Cafe Racers appeared in the 50's and 60's with amateurs and professionals fitting Triumph engines into Norton "Featherbed" frames, with many variations being produced based on the same theme. Wally informed me that he had raced the Cotton at the famous Brooklands Race Circuit at least half a dozen times during the 1934 racing season. He claimed to have been awarded the coveted Gold Star for achieving a lap of the outer circuit at an average speed of 100 miles an hour or more! The speed of his fastest lap was 103.5 mph. Wally said he remembered dicing with a Mr. Loveday, who was mounted on a very quick Lawrence Hartley tuned "Ariel", who also passed the 100 mph mark. ( I have not been able to substantiate Wally's claims of the "Gold Star" award ). The Norton engine had been tuned to run on alcohol based RD 1 fuel with an 11.4 to 1 compression ratio and was fitted with factory race cams. 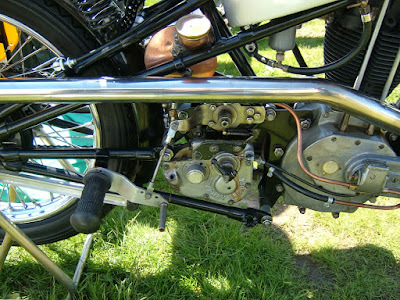 The carburettor used was one of the early Amal TT units ( 10TT 27 ) with a brass body of 1.187" diameter choke and twin float chambers ( this was later changed to a more standard carb ). The piston was a special made to Wally's own design by Wellworthy's, a first class piston manufacturer. By the end of 1934 Wally had his sights set on entering the 1935 Isle of Man TT races. He purchased an extra large fuel tank of 5 gallons capacity, (the largest I've seen on a Cotton) designed to reduce the number of stops for refuelling during the long and arduous races. Unfortunately, due to strapped finances, Wally had to cancel his trip to "The Island", so was never able to satisfy his Ambition of racing in the TT. The preparation of the Cotton didn't go to waste as Wally returned to his first love of grass track racing at Brands Hatch and some of the other circuits in the South of England. His career as grass tracker continued until the outbreak of the Second World War in September 1939, when the Cotton was mothballed until Peace returned in 1945. The Cotton was aired a few more times in 1946, when it was then retired from racing until 1951 to be registered for use on the road as personal transport for a couple of years before ending up under a tarpaulin in Wally's back yard. By 1960 the Cotton was in a pretty sorry state of repair, life in the back yard had taken its toll and there was more rust than paint. But I was more than happy to pay Wally £15 for the bike as I was very well aware of its potential as a Vintage Racer! By the following spring I had stripped and refurbished the Cotton into Road racing trim, although I was prepared to use it for almost any sort of competitive activity on two wheels. Thus began six years of great fun riding the Cotton- Norton, when ever time and funds would allow. An early outing on the Cotton was at Brands Hatch on 1st April 1962, which was on the "Club Circuit" as this was before the longer GP circuit had been constructed. Here, below I am writing how things went for me, lifted almost word by word as I wrote it at the time in my racing diary a couple of days after the race. Practice was uneventful, although the motor didn't pick up on the throttle as quickly as expected, so I decided that the 300 main jet in the Amal Racing Carburettor was too big at 300 and replaced it with a 260. Scratch Race! As usual for me I made a poor start and the leaders were at Druids by the time I got the engine to fire into life. The bike went very well and I managed to overhaul several riders and was not lapped by the leaders of the race. The handling of the Cotton was excellent, which was proved by the amount of leather ground off the sole on the outside of my right boot. I came in at about 10th place! Handicap Race! Left the 260 main jet in place as the engine had run smoothly with good pick up out of the bends. On the starting line! We were graded by the results of the scratch race and I was on the third row with two rows of eight riders in each in front of me. The first two rows setting off at intervals before the third row got our signal to shove off and bump start our bikes. The engine barked into life, it was a good start. There were only three of us in the third row, six in the forth row and the three fastest riders in the back row. They were Chris Williams on Clive Waye's Scott 600, Roger Cramp on his Velocette and John Wilkinson on Stan Johnson's 588 Norton. I went quite well, overtaking many riders, only being passed by Williams on the forth lap at Kidney Bend and by Wilkinson on the fifth and final lap also at Kidney. I followed Wilkinson round Clearways Bend still losing ground but made up some of the loss on the finishing straight and ending the race about a yard behind him as we crossed the line. This meant, that in the race I had passed all but one rider starting in front of me and had been overtaken by two of the best riders in the last row. Jets; 260 best, although carburettor needs tuning properly. 1st gear jumped out at times, all gears got a bit lumpy towards end of meeting but foot change successful. Steering; Marvellous if power kept on but wobbled if shut off when heeled over. Engine seemed off tune a bit at end of meeting? Points should be checked etc. Oil was coming from magneto chain cover, engine breather and perhaps cylinder head joint. Engine sprocket : 22 teeth. Rear wheel sprocket: 45 teeth. Several other meetings were entered in 1962 and in later years with a best finish in rainy conditions being at Snetterton finishing in second place to Roger Cramp. The south London circuit of Crystal Palace was always a challenging place to race with hardly any run off and even then you would hit a concrete wall or a vertical line of railway sleepers! Whilst the 1962 event was not a big success for me at the time I was later awarded the "Vintage Trophy" for the oldest finishing motorcycle! The award ceremony took place at the Autumn dinner and dance of the ACU, Unfortunately I couldn't afford to go to the function but was sent the trophy by Maggie Smith the then secretary of the ACU. There are many other entries and race reports in my diary, which I'll transcribe at a later date! The Cotton-Norton was raced regularly at the the following tracks:- Brands Hatch, Crystal Palace, Snetterton and Cadwell Park, with grass hill climbs and sprints thrown in for added excitement. Mervyn Stratford gave the Cotton-Norton a few airings at the end of the 70's and into the early 80's with some good results until its final retirement in 1982. The Cotton was then semi-stripped down to donate a few components to "Black Beauty" a replica of the famous "Village Fire Engine" Cotton-Blackburne built and developed by Frances Williams during the 1930's as Brooklands racer and World Record breaking sprinter. About seven years ago a close friend and fellow motorcycle junkie was looking at some of my old vintage racing pics and was very impressed with the shots of me peeling off into Druids at Brands Hatch. This led to his enquiring about what had happened to the Flat Tank Model 18 Norton and for that matter the Cotton-Norton Special? It was painful to report that the Norton had been lent to a fellow Vintage Racer, who some five or six years later got into financial straits and sold it for £15! I never saw any of the cash or the bike again. Regrettably the partly dismantled Cotton-Norton was left to moulder in the corner of my garage. However my friend and fellow bike junkie (Mike Tye) suggested that I return the Cotton to its former racing glory as he would be interested in purchasing it to display in Sammy Miller's Museum. The bike was fully refurbished in 2009/2010 to be purchased by Mike Tye soon after completion. (with the former donated parts being recovered in the process).